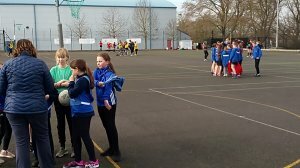 Oakfield Academy hosted the Mendip area year 7 girls netball tournament on 26/3/19. Participating schools were: St Dunstans, Selwood, Hugh Sexey, Oakfield, The Blue, Crispin. The Blue ran out the eventual winners after a league style tournament, with Hugh Sexey second - both schools will now represent Mendip at the County Finals. Fairlands Middle School hosted the Mendip area year 8 girls netball tournament on 19/3/19. Participating schools were: Fairlands, Selwood, Shapwick, Hugh Sexey, Oakfield, The Blue, Crispin. Fairlands ran out the eventual winners after a league style tournament - and will now represent Mendip at the County Finals. 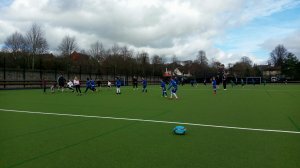 Wells Cathedral School hosted a year 3/4 tag rugby festival on 19/3/19. Over 60 children enjoyed a mini coaching session followed by a total of 15 games of tag rugby. The whole event was supported by Wells Cathedral leaders. Each child went away with a certificate highlighting the importance of being active for 60 minutes per day - along with a drink and a cookie! 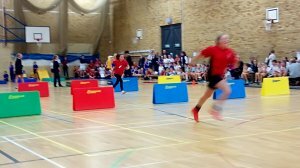 Oakfield Academy hosted the Frome area large schools high 5 competition. Oakfield Academy and Selwood qualified for the Spring Games in April at Millfield. 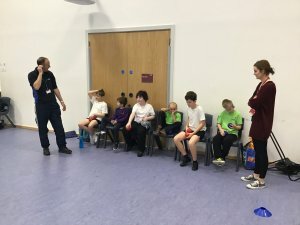 The first of 2 Primary High 5 tournaments was hosted at Strode College on 28th February 19. 7 teams from; Elmhurst, Hugh Sexey, Catcott, Ashcott and Baltonsborough participated in games split into 5 minute quarters. After coping with ever changing weather conditions - Elmhurst, Hugh Sexey and Ashcott secured their place in the School Games finals to be held at Millfield in April. Well done to all participants and good luck to the finalists! Inclusive Multi event festival, 26/2/19. On 26th February 19, Shapwick School hosted an inclusive multi event festival for the Mendip area. 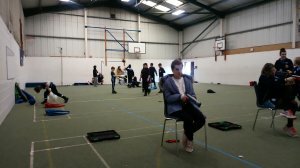 Entries from Shapwick, Catcott and The Mendip School meant 18 students enjoyed sessions in - seated volleyball, skittles and laser pistol shooting. The students voted laser pistol as their favourite and we thank Carly for bringing these along. In the Summer Term, the Mednip area plan to host an inclusive athletics event at Critchill School. 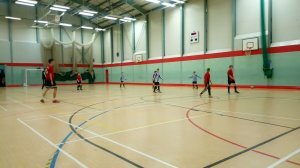 The Mendip round of the u12 futsal competition was hosted by Strode College on 12/2/19. With 3 schools competing; Catcott, Elmhurst and Oakfield in what was to be a very closely contested competition. Oakfield ran out the winners and will now go forward to the county finals. 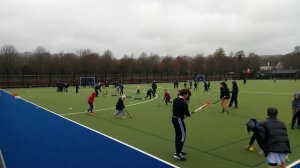 Wells Cathedral School hosted a Mendip area quicksticks hockey coaching session for years 3/4 on 8/2/19. With 3 schools participating; Catcott, Mells and West Pennard - we had over 60 children receiving coaching and playing mini games. The sessions were ably assisted by Wells Cathedral leaders. 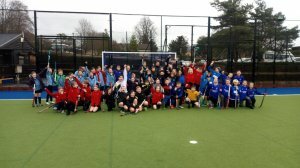 Wells Cathedral School hosted the Mendip area primary hockey tournament on 8/2/19. With 6 schools competing; Catcott, Kilmersdon, Elmhurst, Springmead, Fairlands and Oakfield - we had 60 children playing in a league style competition. The games were ably officiated by Wells Cathedral leaders. With the overall winners being Springmead. 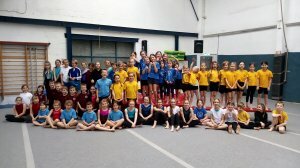 Liberty Gymnastics Club, Frome hosted the second of 2 Key Steps Gymnastics competitions for the Mendip area on 31/1/19. 54 gymnasts across years 1,2,3,4,5,6 performed both floor and vault routines to gain an overall team score. 6 gymnasts competed as individuals, again completing a floor and vault routine. Beckington won both the years1/2 and years3/4 competitions with Selwood successful in the years5/6 competition. 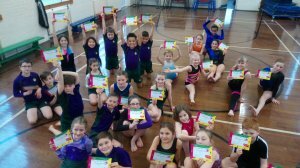 Elmhurst Junior School hosted the first of 2 Key Steps Gymnastics competitions for the Mendip area on 24/1/19. 26 gymnasts across years 3,4,5,6 performed both floor and vault routines to gain an overall team score. Springmead won both the year3/4 and year5/6 competitions with Elmhurst successful in the individual competitions. The Mendip area secondary girls hockey tournaments were played out at various venues during November and December 2018. Thanks to host schools; we had 9 schools compete across the 5 competitions and a total of approximately 230 girls participating. The Mendip School in Shepton played host to the area Boccia tournament on 29/11. With 7 teams from The Mendip, Shapwick and Critchill schools participating in a series of Boccia games, meaning 21 children participating in friendly competition. The morning was played in a really nice atmosphere - with all the children supporting each other, regardless of the school they came from. 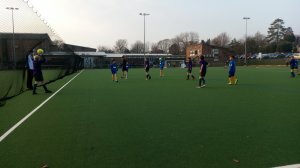 Wells Blue played host to the Mendip area Year8 girls hockey tournament on 28/11. 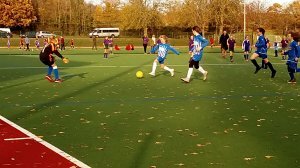 6 teams from Wells Blue, Crispin, Selwood, Oakfield, Hugh Sexey and Fairlands played in a league style competition with half pitch games on the astro. All teams gave their best in difficult weather conditions - with the top 2 teams now going forward to represent Mendip at the School Games Finals. We wish Fairlands and Wells Blue good luck! 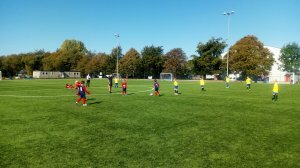 Frome College played host to a year 3/4 football festival on 27/11, with 5 teams playing in a league style tournament on the astro. Schools in attendance were; St Pauls, St Johns, Rode & Norton, Christchurch. Each school played 4 games of 15 minutes and these were ably officiated by Year 10 boys from the College. A big 'WELL DONE' to all for braving the wet weather = the rain won't stop us! The 'north section' of the Mendip Area Small Schools Football competition was played at Frome College on Thursday 22nd November. 3 teams from 3 schools; Springmead, Bishop Henderson and Kilmersdon played in a league structure tournament. Some superb games of football were well refereed by Year 10 students from Frome. Congratulations to the winners, Kilmersdon and they will now go through to the next round. Wells Blue hosted the Mendip area year 7 girls hockey tournament on 22/11/18. On a bitterly cold evening teams from Selwood, Oakfield, Blue, Hugh Sexey and Fairlands played out a league style tournament. It was great to see the effort, team-work and skill level of the players - well done! The top 2 qualify for the School Games finals at Millfield - Hugh Sexey and The Blue. The 'north section' of the Mendip Area Girls Football competition was played at Frome College, on Tuesday 13th November. 6 teams from 5 schools; St Pauls, Oakfield, Selwood, St Benedicts, and Springmead played in a league structure tournament. The event was played with a brilliant atmosphere, the girls growing in confidence as the tournament went on. Congratulations to the winners, Oakfield, - they will now go through to the County Finals in January. 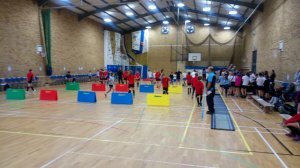 On Thursday 25th October, Wells Cathedral School hosted the Mendip area primary schools sports-hall athletics qualifier. 48 schools; Oakfield, Selwood, Shapwick, Walton, Catcott, Baltonsborough, West Pennard, Oakfield and Horrington entered 17 teams across years 5 and 6, girls and boys - making for a competitive afternoon. Following an hours coaching, which was facilitated by WCS staff and young leaders, the competitive event got underway. Congratulations to the winners; Selwood in the large schools and Catcott in the small schools events. On Tuesday 23rd October, Wells Cathedral School hosted the Mendip area secondary schools sports-hall athletics qualifier. 4 schools; Oakfield, Selwood, Shapwick and Crispin entered 12 teams across year 7 and 8, girls and boys - making for a competitive afternoon. Congratulations to the winners; Oakfield in year 7 girls and year 8 girls and boys, and Crispin in the year 7 boys. 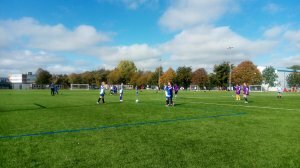 The 'south section' of the Mendip Area Large Schools Football competition was played at Strode College, Street on Thursday 11th October. 9 teams from 7 schools; Elmhurst, St Pauls, West Pennard, Fairlands, St Benedicts, Stoberry Park and Hugh Sexey played in a league structure tournament. Some superb games of football were well refereed by L2 BTec students from Strode. Congratulations to the winners, St Pauls, - they will now go through to the County Finals in January. The 'south section' of the Mendip Area Girls Football competition was played at Strode College, Street on Thursday 4th October. 7 teams from 6 schools; Elmhurst, Ashcott, West Pennard, Fairlands, Walton and Hugh Sexey played in a league structure tournament. Some superb games of football were well refereed by L3 BTec students from Strode. Congratulations to the winners, Hugh Sexey, - they will now go through to the County Finals in January. 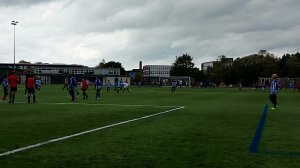 The 'south section' of the Mendip Area Small Schools Football competition was played at Strode College, Street on Thursday 27th September. 4 teams from 4 schools; Catcott, Ashcott, Baltonsborough and Chewton Mendip played in a league structure tournament. Congratulations to the winners, Ashcott and they will now go through to the next round.